On a daily basis, mobile phones help change people's lives and improve communication worldwide by creating access to services. On a daily basis, mobile phones help change people's lives and improve communication worldwide by creating access to services and enabling economic development. Although there is no evidence to convince experts that the use of mobile phones and the masts that make them work carries health risks, some people are still concerned. Safeguarding the health and safety of our customers, employees and the public is paramount. By demonstrating leading edge practices and encouraging others to follow, we aim to lead the industry in responding to public concerns regarding mobile phones, masts and health. Mobile technology operates well within the safety limits set out by international guidelines. The opinion of the independent World Health Organization (WHO) remains the same: there is no evidence to convince experts that this technology poses any risk to human health. Your mobile device converts voice and data messages into radio waves, which are part of the electromagnetic wave spectrum. The radio waves are transmitted as electrical signals through a network of base stations. Each base station has a cabinet and antennas to send and receive your communication. The antennas are usually fixed to a support structure such as a mast. Base stations relay your signal through cables, or a microwave connection, to a core switching centre, from where it is routed to its destination using the same technology. There have been thousands of scientific studies into the effects of radio waves on health. The vast majority of experts – such as WHO and the International Commission on Non-Ionizing Radiation Protection (ICNIRP) – agree there is no evidence that the use of mobiles or base stations result in adverse health effects when operated within guideline safety limits. Mobile devices have transformed how hundreds of millions of people manage their daily lives and run their businesses. Global adoption has been rapid compared with other technological developments in previous eras. Scientific reviews have made a vital contribution to establishing industry guidelines and standards. Vodacom follows the results of these independent expert reviews to understand developments in the scientific research related to mobile devices, base stations and health. We consider the opinions of panels commissioned by recognised national (see list below) or international health agencies such as the World Health Organization (WHO) and the International Commission on Non-Ionizing Radiation Protection (ICNIRP). We support open debate on the body of published scientific evidence and will continue to share information on significant scientific developments. Scientific discovery is a process. Those discoveries pass through several phases: from hypothesis, through testing and analysis, to writing up results and publication. That publication may then be reviewed by others in a process known as peer review. In addition, other scientists will often try to replicate the study to see if the findings can be repeated. This short animated film describes how this process works. WHO: Are there any health effects? "In a recently published factsheet titled 'Electromagnetic fields and public health: mobile phones', the WHO stated that "a large number of studies have been performed over the last two decades to assess whether mobile phones pose a potential health risk. To date, no adverse health effects have been established as being caused by mobile phone use." Are mobiles devices and masts safe? Base stations are designed to send and receive electrical signals from mobile devices and relay them to a core switching centre. Each base station consists of antennas and a cabinet with equipment to power it. The antennas are usually fixed to a support structure, which is known as a mast. Your mobile phone only works if it can connect to a base station. The majority of experts and national advisory boards say there is no scientific reason to distance base stations from places where people live and work, as long as the International Commission on Non-Ionizing Radiation Protection (ICNIRP) guidelines are adhered to. These guidelines include a substantial safety margin. Surveys have shown that the RF exposures from base stations range from 0.002% to 2% of the levels of international exposure guidelines, depending on a variety of factors such as the proximity to the antenna and the surrounding environment. Your mobile device converts radio waves into electrical signals in order to send and receive your communications. At its peak (when the phone is turned on), power use ranges between 0.1 and 2 watts. The radio waves that mobile devices rely on are at the non-ionising end of the electromagnetic spectrum. While a mobile device is used close to the human body, a small amount of energy from the radio waves is absorbed and this is converted into heat. Scientific research has concluded that a temperature rise of no more than one degree Celsius is a safe level for the body. Our normal biological processes cool us down and prevent any significant temperature rise in our bodies. The vast majority of experts, including the (WHO), agree that mobiles, operated in line with international guidelines, do not produce enough energy – and therefore heat – to cause long-term changes in the body. 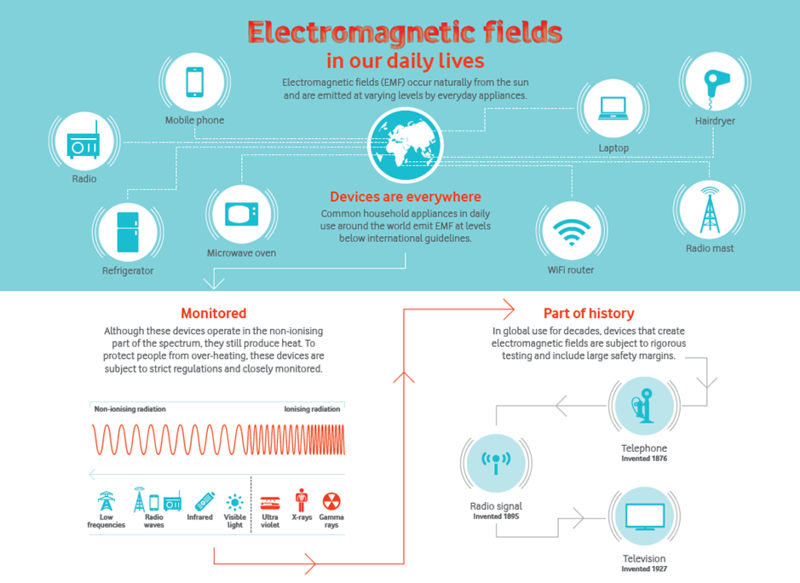 WHO periodically reviews the science and is currently conducting another risk assessment of radio frequency electromagnetic fields. This is based on an extensive review of scientific studies published since their first review in 1993 and is due to be published in 2017–2018. How do mobile devices work? Connect to the base station providing the best signal – usually the nearest. As a person moves away from the base station the signal becomes weaker, so the mobile device automatically adjusts its own transmit power to maintain the minimum needed to communicate with the base station. The area covered by a base station is known as a cell. Each cell is usually split into three sectors, which overlap with the sectors of neighbouring cells to create an uninterrupted network. When people travel, the signal is passed from one base station to the next, and typically never has to travel further than the nearest base station. The size and shape of each cell is determined by the features of the surrounding area, such as buildings, trees and hills, which can block signals. Cells are largest in flat open landscapes, where they can cover a radius of several kilometres. Cells in urban areas typically cover up to a two kilometre radius. The smallest cells, covering a few tens or hundreds of metres, are in built up areas, where micro-cell base stations are used to provide extra coverage and capacity. Each base station can only handle a limited number of connections at a time. In areas of high demand, additional antennas are sometimes added to a base station to send and receive more calls and other mobile services, or an extra base station is installed. A large number of base stations are needed to allow more people to use mobile devices, from more locations, and for coverage to be continuous when moving around. Is using a mobile phone harmful for children? All our phones and devices conform to international guidelines, which ensure protection for everyone. The International Commission on Non-Ionizing Radiation Protection (ICNIRP) guidelines are designed to protect the entire population, irrespective of a person’s age, and include a substantial safety margin. Children use mobiles to study, stay in touch, for gaming and to go online. Some parents are concerned that their children’s health may be affected by their regular use. To help parents make an informed decision about their children’s mobile use, we provide information and advice from the World Health Organization (WHO) and its linked organisations. The majority of national and international scientific opinion, including from WHO, has concluded that the research undertaken to date shows no evidence of risks to human health. As young people today are likely to use mobile phones over a much longer period in their lifetime, WHO has made it a priority to carry out further research into this area. Studies into the use of mobiles by children and usage of more than 10 years are currently under way. Vodafone closely monitors the results of such research and the views of international bodies such as WHO. In May 2011, IARC classified radio frequency (RF) fields as possibly carcinogenic to humans, and stated that more research is needed in this area. A number of studies are already underway under the WHO’s research agenda priorities. The results of one such study, the CEFALO study into mobile use in children, were published in July 2011. The study involved nearly 1,000 children in Denmark, Sweden, Norway and Switzerland. The study compared mobile use by children and adolescents aged 7-19 years, who were diagnosed with a brain tumour between 2004 and 2008, with that of a randomly selected group of the same age range. The study found no overall evidence of increased risk of brain cancer, concluding that: “The absence of an exposure–response relationship either in terms of the amount of mobile phone use or by localization of the brain tumor argues against a causal association”. ICNIRP produces guidelines governing RF exposure from mobile devices and base stations, and these are designed to protect the whole population, including children. All phones and devices sold by Vodafone; and all base stations operated by Vodafone, are designed to comply fully with ICNIRP guidelines. In August 2009, ICNIRP released a statement confirming there is no scientific evidence to suggest that using a mobile device poses adverse health risks for adults or children. ICNIRP also published a review of the scientific evidence concerning RF exposure in 2009. This states that: “The experimental data do not suggest so far that children are more susceptible than adults to RF radiation, but few relevant studies have been conducted” and that “Overall, there is no robust evidence of any effect of mobile phone type RF on children or adolescents”. In May 2011, the WHO and ICNIRP held an international health expert meeting on children and non-ionizing radiation. The meeting aimed: “to determine if the ICNIRP guidelines are adequate to protect children – who are different in terms of physiology, anatomy and lifestyle”.